“See you in 10 minutes” The famous last words any game operator wants to hear before closing the door and locking you in a room, these words get us thinking. Here at Breakout everyone knows we have 12 different rooms with different difficulties which range from 2 star to 5 star. Most people like a challenge and goes for our 4 star rooms if they have never played before, this could be just because they like the sound of the room, it was the only time they could do or they just didn’t know. One of your friends has been wrongfully imprisoned; can you infiltrate the prison and help them break free? Infiltrate is one of our 2 star rooms with 70% success rate. A detective has sadly been murdered in his office and you are being framed as his killer, can you save yourself by finding out who killed him? With the success rating being 59% The Detective Office is a 3 Star difficulty. Can you slow down the outbreak and find the cure? With the success rate of 46% this is one of our 4 Star difficulty rooms. Sabotage is a 5 Star difficulty and our second hardest room with the success rate of 27%. As a group of thieves you have wondered into Zack’s room to steal his valuable collectables. Your friend has been murdered, do you have what it takes to IDENTIFY this psychopath's other victims? Think of yourselves as bounty hunters of the Wild West breaking in to a saloon in search of loot! Make sure you're out by the time the sheriff returns. Most Wanted is a 3 star difficulty with 59% success rate, as well as breaking out of this room you will have to collect as much loot as possible! Dr. Andrews has gone mad and has brought you to his lab for his final experiment, escape before his experiments take full form! It’s time to play a game, you have 60 minutes to escape, or your life will end. So if you have never played before or have and just want to break a record you can now see all the statistics you need to do so! 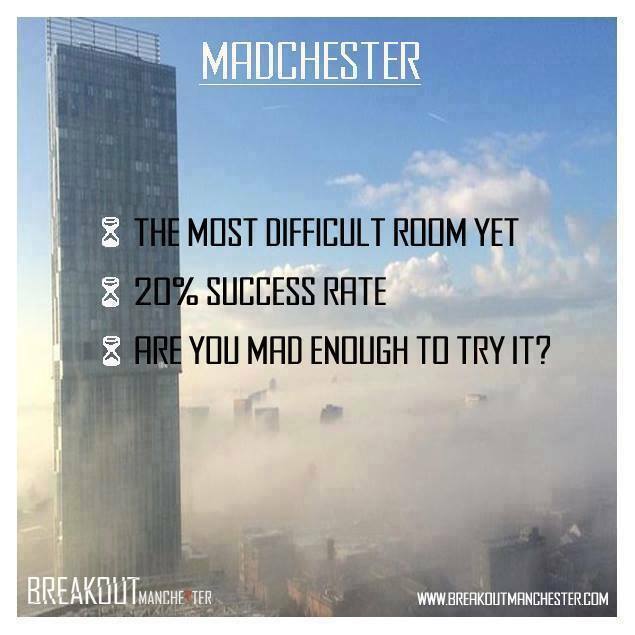 So if you fancy booking to challenge yourself feel free to give us a call on 0161 839 8012, Good luck!